In reviewing HireWriters.com, we made it a point to be different in our approach because this site is unlike other services that we have reviewed. This is a content writing service where clients can go to find the right writer who can write content for their websites and not an academic writing website. Just like what we always do, we checked reviews about them all over the internet, the BBB website, as well as testimonials for clients who previously availed of their services. Although we had a hard time finding credible sources, upon requesting for a essay writer, we were still able to give a review of this site based on our experience. Since this is not an academic writing website, you won’t be able to request them to write academic papers for you. This is a content writing service, therefore, the services you probably can expect are article writing, writing posts on social media, blogs, etc. HireWriters.com are mostly content you can use for your own website and not for a thesis. So, we asked them to write for us an original article of 500 words and we requested them to have a skilled writer write it for us. We are giving HireWriters.com a mediocre rating instead of best. Based on the article that we requested, we noticed a few errors on grammar and spelling as well as the article also has a problem on coherence. It just doesn’t flow smoothly. In fact, it reads like it was not really written by a skilled writer but by a high school student, when we requested a skilled writer in the first place. Of course, we asked them to revise the article and fix the issues we found. They did revise the article but it was still no good. It seems as though they don’t see the weak points in their writing very clearly, which made us believe that the writer is really not a professional essay writer. In terms of HireWriters.com reputation and reliability, we are giving this service a rating of medium low. We can assess that this site is not a scam site because we received the article we requested. While you can rely on the fact that they are operating legally, you’d just be disappointed of how misleading their service is because they don’t really live up to their claims about the quality you will get. It turns out that the quality you will get is not the quality you want to pay for. For a 700-word article, you will be amazed because you will be paying less than $5. But upon researching about the company, we found out how poorly-written these articles are. Some are even convinced that the articles were not written by native English speakers even if they claim they are. In short, because of the quality you will get, you will feel deceived and scammed. For clients, you will like the fact that prices for their articles are extremely low compared to other services. However, the pricing is also extremely low for their writers. While this may be a good thing for clients at first, this is not good for writers as well as in the long run, not good for clients. The best writers know how much they are worth and hiring them means paying higher. The fact that they are paying for low level writers based on the low pricing they offer would make you doubt that they are able to write quality articles. As to discounts, they do not offer any. But it doesn’t matter because in terms of pricing, they are already affordable. The real problem is just in the content quality. You won’t find much freebies unlike academic writing services. But as we visited their website, we found blogs about their company. The good thing is that these blogs are well-written and very interesting even if the information is not mainly for clients but for writers. Other things we noticed on their website is that it is not so user-friendly. It’s hard to navigate and obviously outdated. 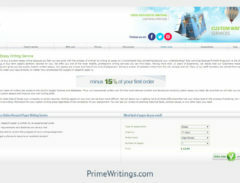 Obviously, HireWriters.com is not for students because this is not an academic writing service. This service is for businessmen and those who are maintaining a website or a blog online. However, even if this is so, we do not really recommend this for those who seriously want their business to thrive. If you want quality articles, do not go cheap and reap disappointment only. It is better to pay a tad higher as long as you are sure of the quality. There is one thing this service is good at though. It is in making people believe and convincing them that they offer quality articles but once you jump in, that is where the problem starts.